The long-awaited results of the Savannah River Ecology Laboratory (SREL) study are finally in, and none of the animals in the study survived the winter. 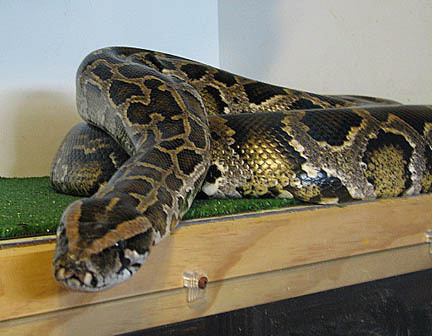 While that is not much of surprise to someone who has kept Burmese pythons, the real question remains. Will the results of this independent scientific study finally end the debate that has taken so much time, energy, money and jobs from our community and industry? This has never been about science. It's been about the money and it's been about the media and it's been about getting re-elected -- but mostly it's been about the money. Pythons and our community just happen to be in the wrong place at the wrong time. Regardless of the fact that the SREL study was an unbiased scientific study by an unbiased organization, since its conclusions have come down on "our" side of the fence it's now "our science." We can expect the opposition to either ignore it completely or find ways to discredit either it or the people involved. Millions of dollars in federal funding for the removal and remediation of these species, needed or not, are on the line, and you can expect that the individuals and organizations set to get a piece will all line up to take shots at the study. To read the abstract of the SREL python study click here. If you're going to try to cheat death, should probably make more than two days' wages in the process. The farm laborer eventually became violently ill and ultimately ending up in the hospital with a severe case of nausea and vomiting. In between the violent expelling of his stomach contents, one can only presume he was laughing over the fact that he totally won the bet. This is one of those stories where you have to wonder if it's true. If it is, the snake species wasn't identified. My best guesses are one of these four: Indian cobra, common krait, Russell’s viper (pictured), and the saw-scaled viper. What do you guess? And do you think it's real? And what would you do for two days' wages? While out stalking deer, Sitesh Ranjan Deb was attacked by a Himalayan Black Bear. Nearly loosing his life gave him a different perspective on the native species, and changed his path forever. "Many of the species I grew up with -- wild boars, leopards -- are hardly ever seen now. These animals are in their last days. "Illegal logging has damaged the forest so much there is no food for the animals. Unless we act now, they'll be gone forever in a few years." Sitesh, 62, nurses injured wild animals brought to him by villagers back to health and also appears regularly on television shows campaigning for better public attitudes towards wild animals. If possible, he releases the animals back into the jungle, while others he keeps in his small zoo -- including two hand-raised Himalayan black bears after the mother was killed, a 5.5 metre (18 foot) python and a rare albino fishing cat. Even Sitesh's family home is filled with animals, the more "difficult cases" which need 24-hour care. Two jungle cat cubs, a baby python and a badly-injured Slow Loris (a primate species) are currently in residence. "So far, I've freed more than 1,000 animals and that's not counting 2,000 birds," he said, displaying photographs of many former patients. To read the full, story click here. We all know snakes get a bad rap. Tell a stranger you love snakes, and you're usually rewarded with a cringe. But the state of New Jersey is trying to change that, and save native wildlife at the same time. The Venomous Snake Response Team uses facts and understanding to help people overcome their fear and loathing. This cuts both ways — sympathizing with peoples' fears while helping them see the world from a snake's-eye point of view. New Jersey has 22 species of snakes. Of these, only two are venomous: the timber rattlesnake and northern copperhead. Snakes are a vital link in the food chain; they help control insect and rodent populations and, in turn, provide food for raccoons, bears, coyotes, hawks and owls. Snake populations have long been on the decline in New Jersey due to factors like road traffic, destruction of habitat, pollution, human persecution and snake collectors, to name but a few. As development encroaches on snake habitat, people find themselves living on top of the pathways snakes have used for centuries to travel between dens and foraging areas. Some new developments have been built right on denning sites! Despite wildlife laws prohibiting killing, collecting or harassing native snakes, fear drives many people to kill them. Non-venomous species like northern water snakes are often mistaken for venomous varieties, increasing the fear factor. Here's to one state taking a proactive stance on education! Other concerns with the Commonwealth Games in Delhi aside, some are making the biggest complaint about the snakes. A South African athlete had a surprise in his room, and the teams are expressing concerns over safety. A South African athlete discovered the unwelcome guest in their room and the South African High Commissioner Harris Mbulelo has admitted he is now worried about the Games. "We have very grave concerns," Mbulelo told the Press Trust of India news agency. "If snakes are found we can't ask our teams to stay there." JOHN TAYLOR: And an unexpected hazard has emerged for India's organisers. Indian media is reporting that the South African team found a snake in one of its rooms in the athletes' village. And the Times of India newspaper carried a front page photo today of a man removing a one metre long Cobra from the Tennis Stadium. STEVE MONEGHETTI: You don't want to see one. We come from the country got the most venomous snakes in the world so if any country is prepared it's probably us. Maybe we've planted a couple, I'm not sure, what sort were they? Did you get the identification of them? STEVE MONEGHETTI: Cobras. Right, okay. Maybe, maybe, yeah well, its only a Cobra. What are we worried about? MARK COLVIN: Well maybe just bring in some Mongeese. With all the other problems, I think at this point they are just looking for something else to pile on. Continue reading "Herp Report: A snake enters the Commonwealth Games"
Xan: Do my feet smell? I have to thank Cindy for the photo caption, but really I have to thank Xan for proving to be a most amusing captive.